At subluminal speed we have shown that round-trip conventional (i.e., exploiting Newton's Third Principle) spacecraft journeys to distant galactic destinations cannot be accomplished within the lifespan of the Earth-bound project team. But what if the spacecraft can exceed the speed of light? Some investigators have been so bold to postulate the possible existence of faster-than-light entities [Tanka, 1960; Bilaniuk, 1962]. There is a mathematical approach to the Lorentz transformations that avoids violating Einstein's Special Relativity that involves introducing the so-called imaginary square root of minus one (''i'' is its mathematical symbol). The consequence is that all results become real numbers (and not imaginary, in the mathematical sense!) only if the speed of the spacecraft is greater than the speed of light. If the spacecraft speed could be much greater than the speed of light, then the distance divided by speed becomes vanishingly small, even over enormous distances. Thus destinations that are millions of light years distant from Earth could be reached in short intervals of time if the ship acceleration could be quite large and the speed or the spacecraft many times the speed of light. But even if the ship speed is many multiples of the speed of light, the duration in spacecraft time is the distance divided by the speed of light, and that determines the spacecraft time elapsed during the mission and the physical aging of the crew [Jones, 1982]. 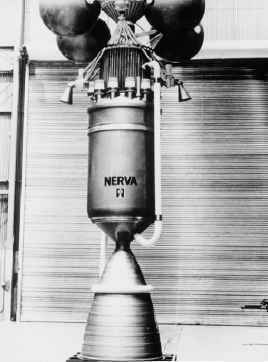 Thus, even with an 80-year lifespan of the spacecraft crew, the crew could only reach, and return from, stars that are less than 40 light years distant from Earth. So for less-than-light speed (sublum-inal) travel, it was the lifespan of the Earth-bound observers that was the limitation; for greater-than-light speed (superluminal) travel, it is the lifespan of the spacecraft crew that is the limitation. In both cases limitations are equally severe: without a radically different approach to propulsion we are confined to the region around our Solar System. Figure 9.6. The ship jumps out of conventional space into Einstein space-time. into a dimension "perpendicular" to the normal three spatial dimensions and time. In order to accomplish the "jump" the spacecraft must achieve light speed and fly a specific flight path. There is a specific trajectory that can be determined to accomplish the jump [Froning, 2003]. So the first criterion to meet is that the spacecraft must achieve light speed and fly a specific trajectory. In a sense the spacecraft "soars" over space and time of the x-ct plane. The flight segment in this hyperspace can be represented as a parabolic-like trajectory over the x-ct plane and in the x-kr plane, Figure 9.6. 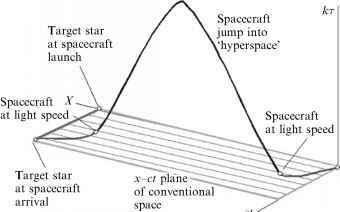 The spacecraft then returns to light speed and an inverse trajectory returns the spacecraft to the physical x-ct plane. There is no material motion associated with the spacecraft travel in the x-kr plane, because the plane contains no time. The spacecraft travel along the x-kr plane would be imperceptible to the slower-than-light-speed observers as the travel occurs within a plane of event/ existence that is at a right angle to the x-ct plane. Thus the spacecraft would disappear after reaching light speed, followed immediately by its reappearance trillions of miles away in the proximity of the target star, when the spacecraft returns to sub-light speed, Figure 9.6. As the spaceship travels upon the x-kr plane the "unfolding of tau" is not the same as the "passage of time" upon the x-ct plane. Here, our classical concept of time is perceived as an inexorable movement toward the "future" from the "past". As referenced from the Scientific American article cited, this perception has no mathematical or physically based reality. By contrast, the essence of tau must be such that kr both increases and decreases during the spacecraft's travel in the x-kr plane. Of course, spacecraft navigation in the x-kr plane is impossible unless position and direction can be determined for each increment of tau as tau unfolds with the spacecraft. There is a detailed mathematical derivation of this strange journey in [Froning, 1983].